There are many levels of opportunity to get FREE help with your Family History and to get the Free Ancestry Report. 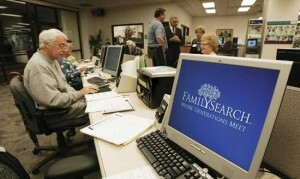 We highly recommend the free website: http://FamilySearch.org where you can get the most free help. 1. Sign into FamilySearch.org and click on GET HELP above where you signed in. Then select Help Center and click on FAMILY TREE. There are hundreds of FREE HELP Articles and Videos for your online training. 3. In the United States you can call 1-866-406-1830 and there are hundreds of Family History Service Missionaries that will help you for FREE with any problem. We have worked these calls from people seeking free help for over 2½ years and have helped many hundreds of cases. 4. You can also take advantage of over 4,745 FREE Family History Centers around the world. Click here to find a location close to you: https://familysearch.org/locations/ type in your zip code to see the green tree showing the location of a center nearest you. Click on the green tree for contact and hours information for that center. We are available for free one-on-one and face-to-face help at the Family History Center, 3000 Old Cheney Road, Lincoln, Nebraska on Tuesday nights from 6PM-9PM and other volunteers are available other days and hours. 5. If you want to take advantage of our offer for a FREE Ancestry Report: Just send us your Name, Phone # and Email Address to FamilyHistoryFree@gmail.com and we will contact you to get enough information to perform a FREE 1 hour assessment of your tree.